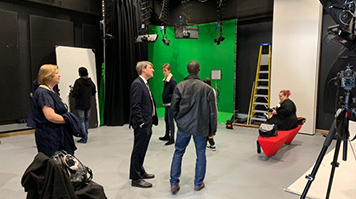 This week, LSBU staff and students welcomed a visit by Chris Skidmore MP, Minister of State for Universities, Science, Research and Innovation (UKRI) to the University’s School of the Arts and Creative Industries. Mr Skidmore visited LSBU’s London Road building where he toured the University’s state of the art training facilities in the purpose-built Elephant Studios, which have been designed to offer students industry-level training for careers in the arts and creative industries. The minister also met with students and was given a demonstration of the facilities, including a fully-equipped radio studio and newsroom for broadcast and online streaming; a Dolby Atmosphere sound recording studio; editing suites for post-production work; production studios with lighting rigs and green screen; a cinema room with 3D and High Definition projection and a Gaming Studio with dedicated areas designed for ideation, production and life-drawing sessions. During the tour, Mr Skidmore met with Vice-Chancellor Professor Dave Phoenix and Professor Janet Jones, LSBU’s Dean of the School of Arts and Creative Industries. The visit concluded with a trip to the Passmore Centre, LSBU’s recently opened apprenticeship hub, where Mr Skidmore met with a range of apprentices from other disciplines, including nursing associates from the University’s School of Health and Social Care, as well as Quantity Surveying and Building Service Engineer apprentices from the School of Built Environment and Architecture. He discussed with each apprentice their reasons for pursuing an apprenticeship and the benefits and challenges of combining work and study. Find out more about the facilities available in LSBU’s Elephant Studios.